Read our King Brother's Dairy interview below to learn all about their recent barn collapse catastrophe and how they were able to overcome it in such a short time with such a huge community response. 1. You now have a new barn for your cows at King Brothers Dairy. When was this completed? The shell was completed April 22nd. We started moving animals into the barn on 4/26. We put our last animal in the barn on 5/16. 2. What was your first thought when you saw the old barn had collapsed? Is anyone inside and/or hurt? Once we knew no people were hurt, we immediately focused our attention to start removing the animals. 3. What was the community response? Unbelievable! My brother and I each made about 5 calls. Within an hour and a half there were more than 200 people here. Fire dept, ambulance, farmers, neighbors and friends. We were very fortunate to have the community support that we received. 4. What kind of assistance were people able to provide? Help removing animals, shoveling snow, providing food, offers of equipment, etc. 5. How long did the rebuilding process take, from start to finish? The collapse was 2/2. We should have the wiring for fans and lights finished in 3 weeks. This will complete the barn. 6. Where did all the cows live during the construction process? The night of the collapse we were scrambling to find a home for 300 animals. There are no empty barns that size near here. We found 9 farmers who were each willing to take animals. 7. How difficult was it to transport all of the cows? Another big challenge. At ten at night we had about 6 different cattle truckers moving cattle. Thankfully we have two friends who were willing to help. One was in charge of finding barns for cattle and the other organizing trucking. 8. What was the biggest challenge throughout the whole process? Initially, in the first 10 hours, we needed to remove the animals from the barn. After that was finished, it was everything that encompassed the collapse. Cleaning up the debris, evaluating animal injuries, checking on cattle at 9 different farms. On the construction side... securing an engineer, choosing a barn design, working with builders on quotes, and of course, the actual construction. In addition, it changed the daily routine of the farm for both the animals and employees. All chores were more difficult and more time consuming. 9. What does the new barn represent for you? It symbolizes all that we went through. When I look at the barn today, I realize we are fortunate to be able to rebuild and persue a normal schedule. 10. What impact did this ordeal have on King Brothers Dairy service to your customers? Through the weeks following the barn collapse, we were able to continue providing service to our customers. Carly who helps with the delivery, worked through the night removing animals from the barn and made home deliveries the next day. There were also many challenging days for our families and employees. We can't thank our employees enough for their long hours of work and dedication through this event. Photograph used with the permission of King Brothers Dairy. 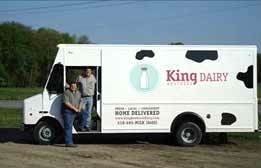 King Brother's Dairy - Meet The New Milkmen!